The hard layer does not absorb the liquid so it can be applied without too much waste. 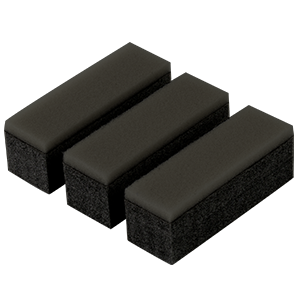 Pika Pika Rain Sponge Applicator is original sponge for Pika Pika Rain Ceramic Coating. Of course, you can keep it as spares, for example, when you drop it. You can also keep it for the second application to get more gloss and protection of Pika Pika Rain Ceramic Coating. *Please put the liquid of Pika Pika Rain Ceramic Coating to the soft side and hold the opposite hard side. *If use it for the application of Pika Pika Rain Ceramic Coating at once, the sponge for Pika Pika Rain Ceramic Coating cannot be reused. What is glass coating [ ceramic coating ]?